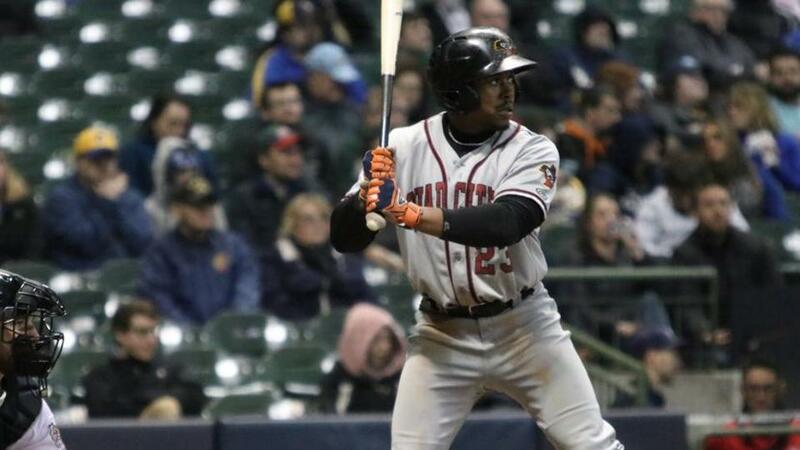 A five-run sixth inning propelled the Quad Cities River Bandits to an 8-3 series-opening victory over the Wisconsin Timber Rattlers at Miller Park in Milwaukee on Friday night. During the big inning, the Bandits collected five hits, four of them going for extra bases, to break away from a 2-2 tie. The win is the fourth in a row for Quad Cities. After a slow start offensively for both teams, the River Bandits (5-3) broke through in the fourth inning to take a 1-0 lead. Enmanuel Valdez worked a walk with one out and advanced to second when left fielder LG Castillo dropped Jeremy Pena's line drive. Cesar Salazar followed by grounding a single through the left side of the infield that allowed Valdez to race home with the game's first run. With men on the corners, Aaron Ashby induced Scott Schreiber into a double play groundout to end the threat. The lead was short-lived, however, as Wisconsin (4-4) evened the score with one swing in the bottom half. Catcher David Fry started the inning with a towering fly ball that just cleared the wall in the left field corner for his second home run of the season. The long ball evened the score at 1-1. Quad Cities and Wisconsin traded runs in the fifth inning as well. The Bandits tallied when Marty Costes ripped a triple in to the right center gap, scoring Jonathan Lacroix from second base. Costes took advantage after his pop up in foul territory was dropped by Fry earlier in the at bat. In the home half, Wisconsin pulled even again when two walks and a hit batter loaded the bases for Brice Turang. The shortstop lifted a sacrifice fly to center to drive in Gabriel Garcia and tie the game 2-2. In the big fifth inning, the River Bandits sent nine hitters to the plate against Ashby and later Robbie Hitt. Pena opened the attack by ripping a triple to right center. Salazar doubled to the same gap to score him and push the Bandits in front 3-2. Schreiber followed with a double of his own to score another run. A wild pitch allowed Schreiber to race home for a 5-2 lead moments later. Before the inning came to an end Ross Adolph added a run-scoring double and Trey Dawson drove in another with an infield single. After all of the damage was done, the River Bandits had a 7-2 lead. The gap widened to 8-2 in the seventh inning. Pena opened the inning with a single and went to second base on a groundout before stealing third. He would race home on a wild pitch with Schreiber at the plate to make it 8-2. The Timber Rattlers pushed across the final run of the contest in the seventh. Turang worked a walk off of R.J. Freure and raced home on a double into the left field corner by Fry who finished with three hits and a pair of RBI. Pena, Salazar and Lacroix each finished with two hits in the game to stoke the offense. Salazar drove in two runs, joining Fry as the only players with multiple RBI in the game. The River Bandits collected a season-high five extra-base hits. Starter Cody Deason went 4.1 innings and allowed two runs on three hits. Freure, the winning pitcher, allowed one run in 2.2 innings. Willy Collado retired all six hitters he faced to close out the game. The trio combined to record 11 strikeouts. The Bandits have struck out double-digit hitters in each of the first eight games this season. The series shifts to Appleton on Saturday evening for game two. First pitch is set for 5:05 p.m. at Fox Cities Stadium. RHP Brett Conine (0-1, 7.20) will pitch for the River Bandits in a match-up with Wisconsin RHP Reese Olson (0-0, 0.00).